French cartoonist and animator Émile Cohl is often referred to as “the father of the animated cartoon.” The legend goes that in in 1907, when motion pictures were reaching critical mass, the 50-year-old Cohl was walking down the street and spotted a poster for a movie clearly stolen from one of his comic strips. He confronted the manager of the offending studio, Gaumont, in outrage and was hired on the spot as a scenarist — the person generating one-page story ideas for movies. Between February and May 1908, Cohl created Fantasmagorie, considered the first fully animated film ever made. To create the animation, Cohl placed each drawing on an illuminated glass plate and traced the next drawing, reflecting the variations necessary to show movement, over it until he had some 700 drawings. Since chalkboard caricaturists were common vaudeville attractions in the era, the characters in the film look as though they’ve been drawn on a chalkboard, but it’s an illusion — Cohl filmed black lines on paper and printed them in negative to make his animations appear to be chalk drawings. Fantasmagorie and dozens of other influential early films can be found on Gaumont Treasures Vol. 2: 1908-1916, with over ten hours of glorious raw material. French filmmaker Georges Méliès is known as the first cinemagician for his early use of special effects in cinema. Between 1896 and 1914, he directed some 531 films, ranging from one to forty minutes in length, usually featuring single in-camera effects throughout each entire film. In 1902, he appeared in one of his own films, l’oeuf du sorcier (The Prolific Egg) — a groundbreaking exploration of scale, multiplication and transitions that truly sealed his reputation as a “cinemagician” and the father of special effects in film. Méliès’ seminal work can be found in Georges Méliès: First Wizard of Cinema (1896-1913), an outstanding 5-disc collection of 173 rare and rediscovered Méliès gems alongside a beautifully illustrated booklet featuring essays by acclaimed National Film Board of Canada animator Norman McLaren, and its sequel, Méliès Encore: 26 Additional Rare and Original Films by the First Wizard of Cinema (1896-1911). Cartoonist and artist Winsor McCay(1869-1964) is often considered one of the fathers of “true” animation. His 1911 film, Winsor McCay, the Famous Cartoonist of the N.Y. Herald and His Moving Comics, also referred to simply as Little Nemo and featured here last week, contains two minutes of pure animation at around 8:11, using sequential hand-illustration in a novel way not seen in previous films. For more on McCay’s work and legacy, look no further than the stunning and illuminating Winsor McCay: His Life and Art. There’s also a wonderfulKickstarter project out to resurrect McCay’s last film, The Flying House — join us in supporting it. British filmmaker J. Stuart Blacktonis credited with creating the first animation in America and was among the first in the world to use stop-motion as a storytelling technique. In 1896, Blackton, a reporter for the New York Evening World, was sent to interview Thomas Edison about his brand new Vitascope invention. In an age where wooing reporters was critical to success, Edison took Blackton to Black Maria, his studio-cabin, and created an impromptu film of Blackton doing a lightning sketch of Edison himself. Blackton became so infatuated with the technology that he soon founded the American Vitagraph Company and began producing films, debuting with The Enchanted Drawing in 1900. In the film, previously featured here, Blackton sketches a face, cigars, and a bottle of wine, then “removes” these last drawings as real objects so that the face appears to react. Although the stop-motion sequence isn’t considered “true” animation in technical terms the way Little Nemo, which Blackman co-directed with McCay, is, the technique offered an early glimpse of what animation could become. Blackton’s films are included in The Origins of American Animation, 1900-1921— a fantastic collection of the work that sparked what became one of the most powerful and permeating movements in visual creativity. 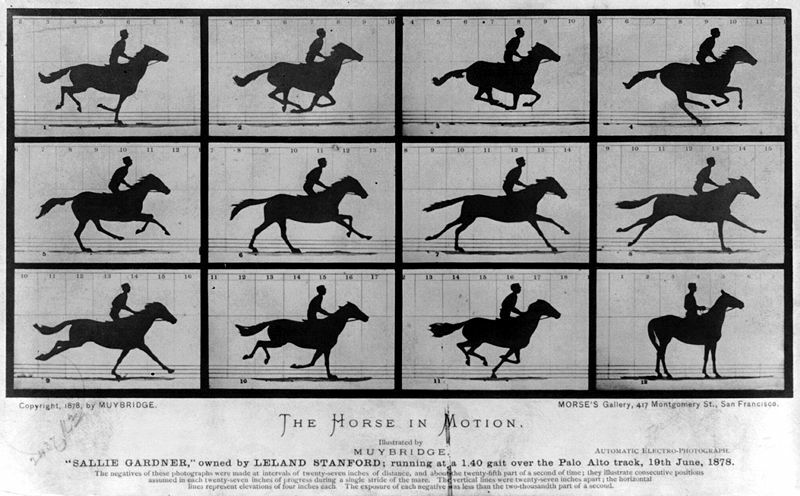 Though the work of English photographer Eadweard J. Muybridge isn’t animation, his animal locomotion studies are among the earliest visual experiments with moving images, laying the foundations for later forms of videography. In 1872, the Governor of California took a public position on a commonly debated question of the era: When a horse gallops, are all four of its hooves off the ground simultaneously. Most paintings of galloping horses at the time showed the front legs extended forwards and the rear legs extended backwards, so Governor Stanford sided with the “unsupported transit” theory and took it upon himself to prove it scientifically. He hired Muybridge to settle the question, who enlisted a series of large cameras using glass plates placed in a line, each triggered by a thread as the horse passed. He paired that with a clockwork device. The images were then copied as silhouettes onto a disc, later viewed on a zoopraxiscope. In 1877, Muybridge finally settled Stanford’s question with a single photographic negative showing Stanford’s racehorse, Occident, fully airborne in the midst of a gallop. Stanford’s racehorse, Occident, fully airborne in the midst of a gallop. In 1893, Muybridge used the phenakistoscope — an early animation device that harnessed the “persistence of vision” principle to create an illusion of motion — to extend his visual studies to animation. Hans-Christian Adams offers an excellent account of Muybridge’s work and legacy in Eadweard Muybridge: The Human and Animal Locomotion Photographs, best examined in parallel with the work of Muybridge’s equally influential French contemporary, Étienne-Jules Marey. For more on early animation, you won’t go wrong with Donald Crafton’s Before Mickey — the most ambitious history of animation from 1898-1928 ever published.